At a crossroads, and can’t find the way forward? Dreaming of success but getting nowhere? You too can change your life for the better. Through my unique life planning programme – a series of simple, highly enjoyable pencil and paper exercises – it’s easy to discover exactly what you want and how to get it. These powerful exercises will allow you to confront your inner demons and clear out emotional debris, so that you can focus on what makes you feel alive and gives you pleasure. You will then be able to uncover your personal powers and tap into your hidden strengths. You too will discover how to turn your dreams into reality and start living. This book was an inspiration for me. I found working through the exercises so fascinating that I completed the whole thing in one day. The most amazing thing about the experience was that I discovered what I really wanted in my life and this enabled me to make a start putting things in place. Since completing ‘How to stop dreaming and start living’ I have embarked on a college course, changed my attitude to my work and am about to get married! Stop Dreaming and Start Living really is an exciting book and I’m so thankful you let me try it out. Not only did the exercises bring clarity, they also created feelings of great energy and optimism. I realized I’ve spent my life marketing other people’s work instead of creating my own. This program revealed the various fears that sabotaged my work, and allowed me to accept that my recent fiction awards were deserved, not just flukes. The clear methods of discovery led me to plan a strategy to give my own work the same dedication I have applied to other people’s. Another very interesting application of Stop Dreaming and Start Living was to analyse the protagonist in my novel and understand what drives her. Just as I had for myself, I created pie charts for my heroine to delve into her fears, and the hopes and dreams that she has for herself. I suspect that this analytical method may prove to be an important tool for writers, particularly writers of fiction. I really am no longer ‘just dreaming’. The living has begun. 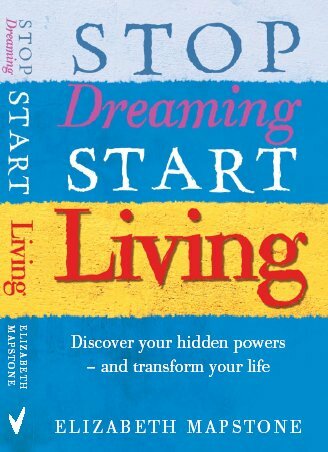 I attended a ‘Stop Dreaming, Start Living’ day workshop with Elizabeth in autumn 2000 and it helped me tremendously in realising what was important to me. Ever since meeting her then I have been eagerly awaiting the publication of her book based around the courses and the experiences of the participants. It’s a day that stands out in my memory. Very happy and very productive. It allowed us to look inside ourselves and dream a little, and everyone needs to dream. It gave me hope. I remember feeling very contented, and somehow it didn’t matter when I felt embarrassed at some of the things I discovered. There was no fear, I felt I was among friends even though they were strangers. People don’t realize how valuable it is to be able to see clearly what you need. And the value increases over time. It was an invaluable day. I urge anyone who can to try it for themselves. If you can’t meet Elizabeth in person, then read her book. I remember the day vividly. It helped me put my ideas into perspective, opened my eyes to possibilities, and gave me goals to pursue. Everything seemed to click into place and I realized where I should be going. Now my life is very good. I love my new job, it’s so interesting, going into schools, visiting somewhere new every day. I just feel good about things now. The Stop Dreaming, Start Living day was such a valuable experience, I shall have to get the book as soon as it comes out. –Kim Spiring, Development worker with UKonline. It was a lovely day. The best thing about it really was that I realized that I wasted such a lot of time dreaming. Now I spend every moment that I can doing something creative. I used to dream about making things, and now I have a go and get on with it. I’ve made lots of quilts and joined a quilting group. The Stop Dreaming, Start Living programme really helped me make better use of my time, and now life is never boring. I’m so glad I went. I really enjoyed the day. Most courses I’ve attended are a big yawn, tiresome and pretentious, but this one surprised me. It was different. It created an atmosphere within the group that instantly cut through the sleeping beauty hedge that surrounds most of us right to real people group doing real stuff. The exercises are very practical and useable, and really did help me find a different way of thinking. Since then I have changed my life quite considerably. I still haven’t got the balance right, but am working on it, and look forward to getting the book as soon as it comes out. I can certainly recommend this programme to anyone. What helped me most were the insights. Now I understand why I make the decisions I do. I hadn’t realized how high a need I have for security and how I want a perfect life for my family. Aiming for perfection is a guarantee of failure, so now I just want to be good enough. But once you have the insights, it’s up to you. I realize now there’s more to life than work, and so I’m planning to retire at 50. I am changing my life, but it’s a slow process and I’d really love to do the programme again. I shall certainly buy the book as soon as it comes out. –Margaret Schwarz, American-born Business executive. We could all use such reminders. Thanks, the book seems quite intriguing.